Wedding Details: save the date! With a destination wedding, save the date cards are especially important. Not only did I want to give our guests an early heads up, I wanted to try to set the tone for the wedding weekend. I set out to find a unique save the date card. I couldn’t be happier with what I found! It’s unique but still makes sense and has become an inspiration for our colors and design scheme for the entire wedding. Michele of Michele Purner Designs created these beauties. You can find her shop on Etsy. The final design had rounded edges, making it look even more sleek. 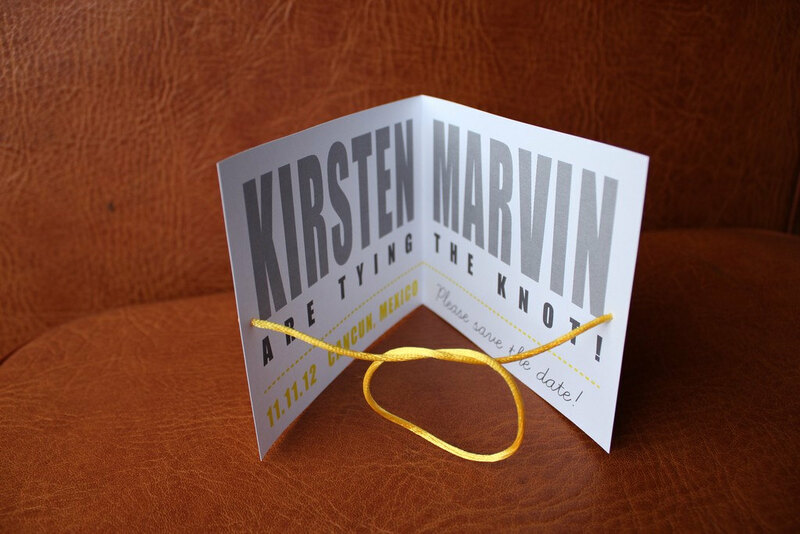 We also added custom yellow envelopes that matched the string. Michele printed the outgoing and return addresses. So I just had to stamp them and drop them in the mail. This was a huge time-saver and the primary reason I managed to get the cards out 7 months in advance. Up next, equally unique invitations. I found a young, up and coming stationer to design custom invites. There is no shortage of custom stationers but the $2400 minimum is just not in our budget! Fingers crossed that this young designer works out!